For those of you unfamiliar with AppleScript, it is an English-like language used to write scripts that automate the actions of your Mac and the applications on it. In short, when you want your applications to start working together, you can turn to AppleScript. It is the lingua franca that helps your programs and you become more productive. Not all applications will let you use AppleScript, and not many font managers do. 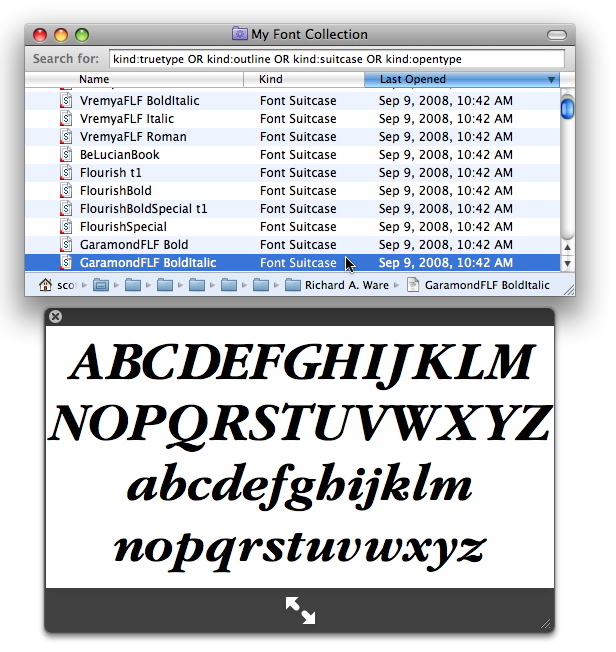 FontAgent Pro from Insider Software supports Applescript as does MasterJuggler. 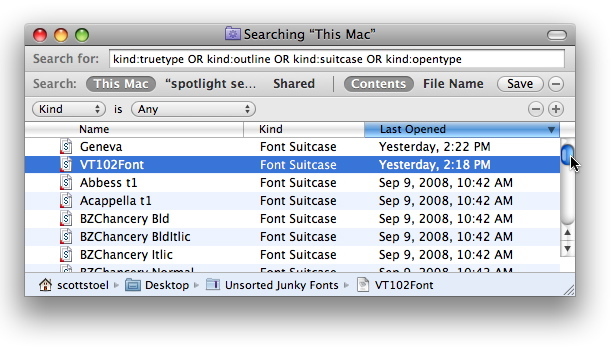 Previous versions of Suitcase supported AppleScript, but the current version of Suitcase Fusion 2 does not. FontExplorer X doesn’t either. So if you have a workflow that uses fonts and you want to automate it with scripts, your choices are limited. 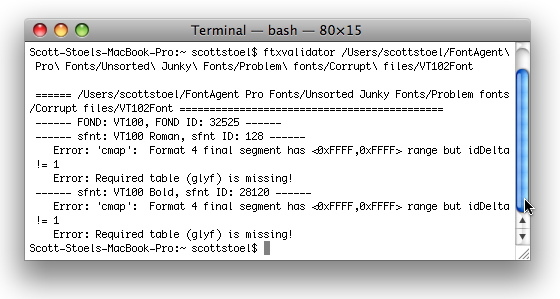 There are lots of things we can automate with FontAgent Pro, but one of the most useful scripts is one that handles the import and activation of fonts by dragging a folder of fonts onto a AppleScript application. In the past, I was employed as a pre-press technician. It was common for me to receive many different jobs from many different clients during the day. The fonts (which they usually gathered using a Package or Collect for Output command) that accompanied the project needed to be imported into FontAgent Pro and activated for me to move forward. 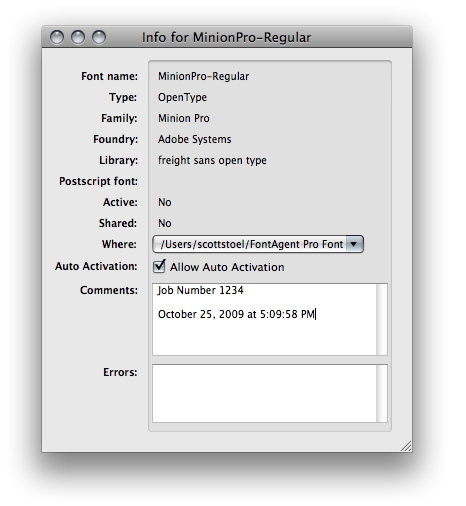 So what I did by using AppleScript and FontAgent Pro was create a droplet application where I would drag the folder of files provided by a client (which was named with the job number) and the fonts contained would be automatically imported into a unique library with the same name as the job number. The script would also deactivate all other fonts in my collection, then activate the library I just imported. At that point I would be ready to launch their project in whatever application they used and proceed. What is provided below is not intended to be a lesson in the basics of AppleScript. There are other much better resources for that sort of thing. If you just want to get the script and start rolling, you can download it here and unzip it on your desktop and you are good to go. The script is provided as is, that means you are using the script at your own risk, and I will not answer emails for support. I am happy to answer any questions you might have and you can reach me at my email, scott@fontgeek.net. If you copy and paste the text into Script Editor, you may get a syntax error when you attempt to compile the script. This is most likely because the quotation marks in the text are “smart quotation marks” or curly quotes as opposed to the straight “dumb quotation marks.” Just do a find and replace with the dumb quotes and you can edit the script from there. Simply take a folder of fonts and give it a name. I used a folder created when I packaged an InDesign CS 4 project for output. 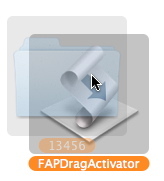 Drag the folder onto the FAPDragActivator icon on your desktop and let the script do its stuff. 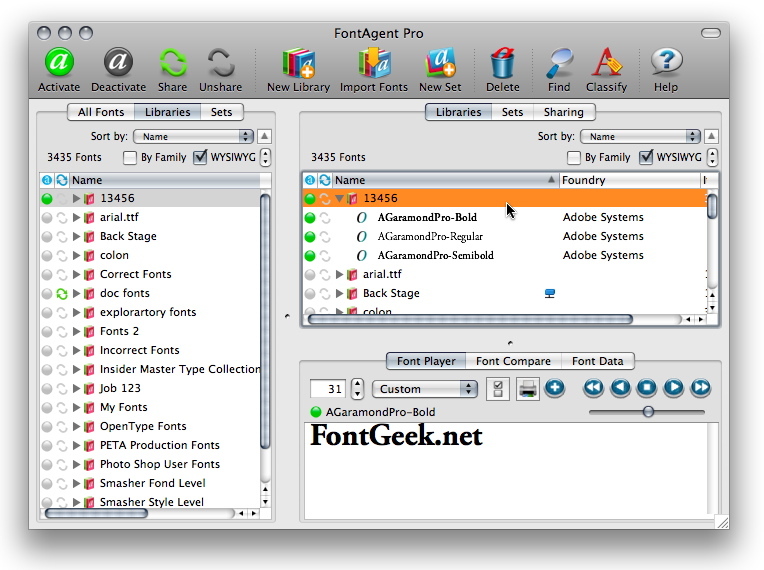 From the screenshot below, we can see that the fonts were imported into FontAgent Pro (in a library named after the folder) and are indicated active with a green activation sphere. Also notice all the other fonts in the collection are deactivated. The fun doesn’t have to stop here. This script can be integrated into a larger script that further automates your workflow. This script could activate the fonts and could hand the document off to InDesign or QuarkXpress to print a soft proof using a preset print setting. In future posts we will talk more about using AppleScript to automate font related workflows. Stay tuned to FontGeek. A few posts ago we talked about Apple Font Tools, ftxinstalled fonts in particular. 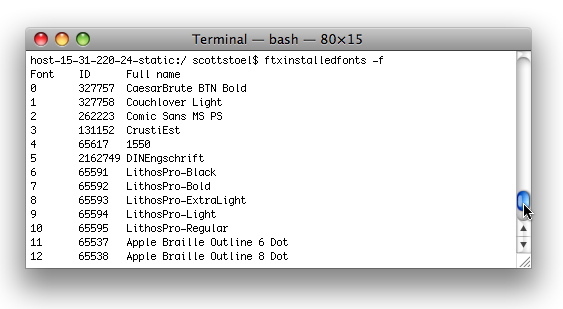 Apple Font Tools is a suite of command line utilities that can help you with many issues concerning fonts on your Mac. One of the helpful tools included in this suite is ftxvalidator. This tool can be very useful if you have fonts that don’t validate in Font Book or in third-party applications such as FontAgent Pro. ftxvalidator can give you more information on why the font is bad or corrupt, and maybe give you a clue as to what to do to fix the font. So if an application tells you a font is corrupt, and you don’t quite agree, or want to know why, ftxvalidator can offer you the second opinion you want. If you already downloaded Apple Font Tools for the tutorial on ftxinstalled fonts there is no need to download again, and you can skip the install instructions below and proceed to the next section. If this is your first time working with Apple Font Tools, download Apple Font Tools Release 3.1.0 at the link here. Download the file, unzip it, then double-click on the Apple Font Tool Suite 3.1.0.dmg to open it. Then, double-click on the Apple Font Tool Suite 3.1.0.mpkg and click through the installer. Since Apple Font Tools are command line based (there are a couple of gui utilities installed as well, but we will visit those later); there is no application you can double-click on to access these tools. You will need to run these tools from Terminal. The utility we are going to look at in this article is ftxvalidator. This powerful tool inspects font files for errors. This tool can be used to examine individual font tables within a file, but here we are going to examine entire fonts which will return information about all the tables ftxvalidator tests for. First we need to launch Terminal. This can be found in the Applications/Utilities Folder. Then at the prompt type “ftxvalidator”, a space, then drag a font file to the terminal window. When you drag a file onto the terminal, it will insert the path to the file. Then hit return. 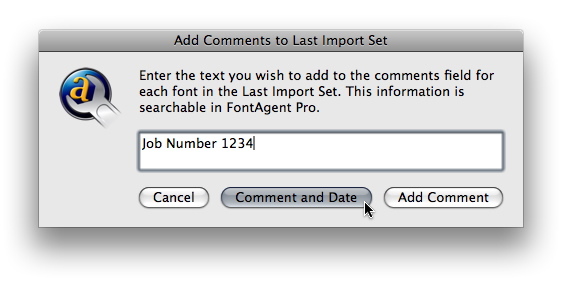 For example, I use FontAgent Pro to manage fonts. One of the features of FontAgent Pro is that it checks fonts for corruption. 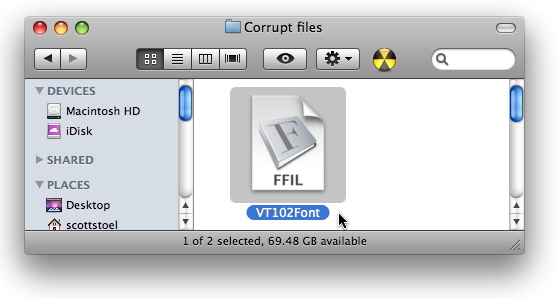 When it finds a corrupt font, it sequesters the font file to a folder called Corrupt files in the FontAgent Pro Fonts folder. 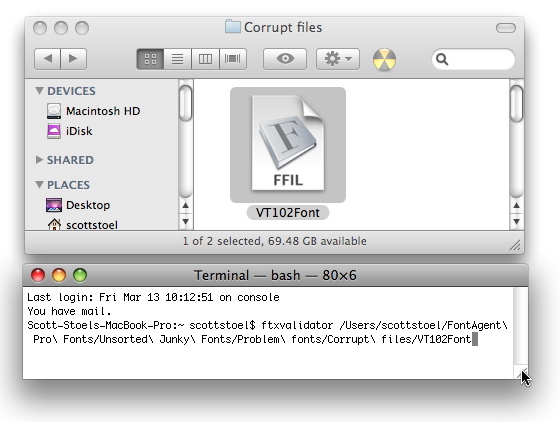 Below, I have a screen shot of a file, in this case VT102Font, that has been tucked away in the Corrupt files folder. To check this font with ftxvalidator all I need to do is copy the text below and paste it into Terminal. From the report we can see that this font had two styles, VT100 Roman and VT100 Bold. Both styles have errors in the cmap table, which suggests a structural problem with the font file. There is also an error in both styles concerning a missing a font table. In this case the glyf table, which is required. From this report we can see why the font was deemed corrupt by FontAgent Pro. Many times the report can give us information that can suggest a plan of action, but with this font there is little we can do. If fact, this font cannot even be opened with a font editor like FontLab Studio or Fontographer. The proceedure above is good for checking one font, but if you want to check a folder of fonts, ftxvalidator can do this too. First, get a folder of fonts. the type cd into Terminal, and drag the folder into Terminal. This changes the working directory in Terminal to the directory containing the fonts. 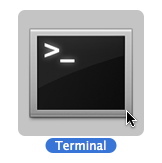 Then type (or copy and paste) the text below to the prompt in Terminal. Note: The asterisk (*) is a wildcard. This means every font in a folder will be checked for errors. If a font does not have any errors ftxvalidator will return the name of the font with no additional information. This writes a file named validatorreport.txt to the desktop. This report can be opened in a text editor and you can easily scan it to see if any of the fonts in the folder have errors. In this article we have taken a look at the validation abilities of ftxvalidator. 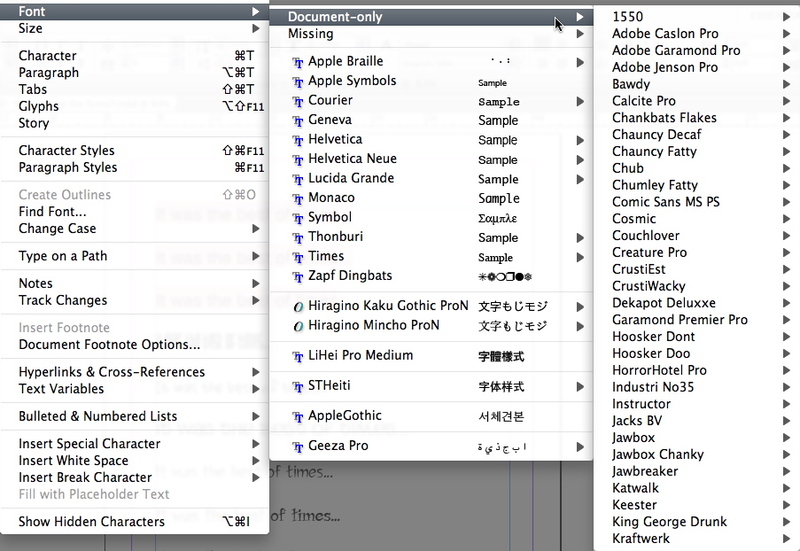 Stay tuned for future posts that show additional capabilities of Apple Font Tools Suite. 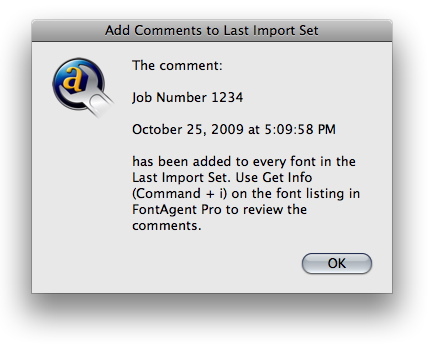 When troubleshooting font issues on your Mac, there are not very many tools that you can use to get under the hood and examine what the problem might be. Most of the time you are at the mercy of interpreting what might be happening. Sometimes you activate a font, but it does not show in your fonts menu, a font appears in your menus and you don’t remember ever activating it. At that point you are left to go between applications and see if the activation state is consistent between apps. And even then you can’t be sure if it is an application update issue, a cache issue or simply if you have a bad font. There is a an application (or in this case a suite of applications) that can help. Apple Font Tools is a little known, but extremely powerful set of command line utilities that can help you with may issues concerning fonts on your Mac. The problem is there are so many things you can do with Apple Font Tools that there is no way to cover them all in a single blog post. I will visit some of the other interesting features of Apple Font Tools in the future, but the first I’d like to take a look at is ftxinstalled fonts. The first thing you will need to do is download is Apple Font Tools Release 3.1.0. The download can be found at the link here. Since Apple Font Tools are command line based (there are a couple gui utilities installed as well, but we will visit those later) there is no application you can double-click on to access these tools. You will need to run these tools from Terminal. The first tool we are going to look at is ftxinstalledfonts. The title of the utility pretty much says it all. 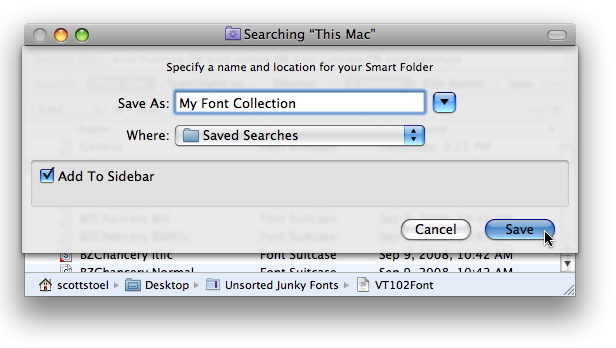 It is a utility to see what fonts are installed on your Mac and where the fonts are located. This may sound trivial, but this is a very powerful tool for troubleshooting activation issues. Next we need to Launch Terminal. This can be found in the Applications/Utilities Folder. For those who suffer from command-line jitters, Terminal can be a frightening place and there is no shortage of warnings for those who venture there proceed at extreme peril. Now it is true you can do some real damage through the command line, but the tool I am going to discuss today is basically a harmless one. In fact, the commands I am going to tell you about you will be able to copy and paste right from this blog entry so you won’t need to worry about typos of the disk erasing, never-ever-ever-recover-your-data variety. To run ftxinstalledfonts type “ftxinstalledfonts” and then, depending on the output you want, add a number of operands to the command. For example, if you copy and paste the line below into Terminal and hit return you will be given a list of the active fonts on your Mac. The information returned can be somewhat confusing because this command will also list fonts on your system that will never appear in your font menus such as Keyboard or AquaKana. But if you are aware that this can be the case (these fonts are found in the /System/Library/Fonts/ folder and are fonts your OS needs) you can get some really useful information form the output. Now if we run the command below you will be given a list of the active fonts and their locations. This information is especially valuable if you are using a third-party font manage as it will be easy to determine what fonts are activated by that application and what fonts are active because they are in a system fonts folder. 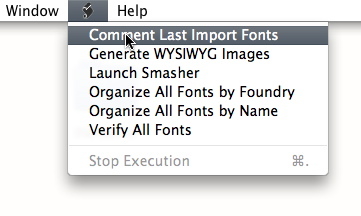 I use FontAgent Pro to manage my fonts. 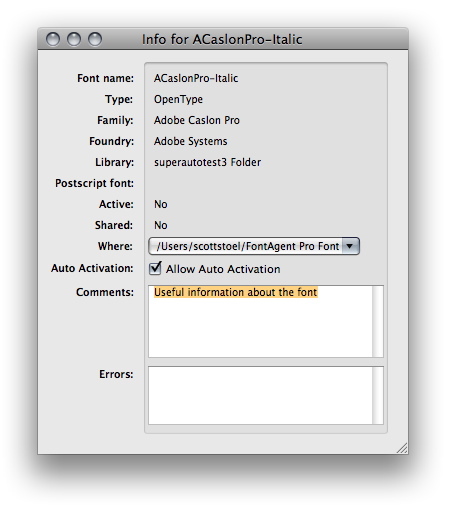 If, for example, I want to find out what fonts are activated from within FontAgent Pro, I can type the line below and only the fonts activated by FontAgent Pro will be returned. Note: The vertical line in the above command is called a “pipe” which takes the results from the first command and feeds it into the next command, in this case grep, which filters all the lines that contain the text “FontAgent.” If you want to learn more about the command command line, just Google “unix command line tutorial” and you will get a bunch of sites that can shepherd you along to command line guru status. From this we can determine that I have five fonts activated by FontAgent Pro (highlights mine) and that Terminal allows you to select non-contiguous text to copy and paste (way cool!). This will give you a list of all fonts in the system, showing their full name, FOND (QuickDraw) name, version name and directory location. And if you would like to get a report of active fonts, you can take that the information into a text file and save it to your desktop using the command below. ftxinstalled fonts can be used for troubleshooting as well. If you have a font that keeps appearing in your menus, although you never activated it in your font manager, it has to be somewhere. ftxinstalledfonts can tell you where it is. For example, suppose we have a font appearing in our font menu in Flash named DINEngschrift, but we have not activated it in our font manager. With the command below we can find the location of the font. After we hit enter we will get the information returned like in the screen shot below. These are just a couple of uses for ftxinstalled fonts. There are lots of other options you can find out about by reading the documentation and tutorials provided with the Apple Font Tool Suite. Keep an eye out for future articles where we will discuss some of the uses for the other utilities that come with the Apple Font Tools Suite.